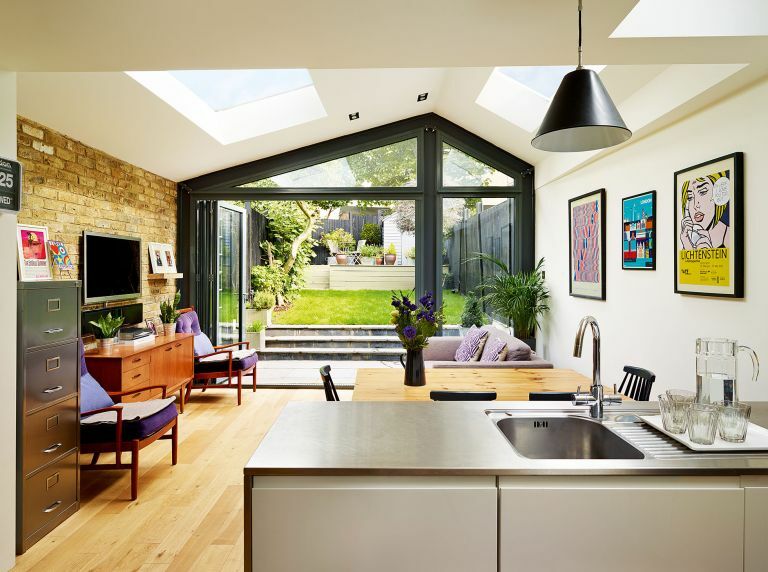 Creating a large family home with an open-plan kitchen extension and loft conversion. The Victorian terraced property that Matt Newman and Michelle Cox bought in 2009 was ideal for a young couple. Fast-forward a few years, however, and the three-bedroom house had begun to feel less practical as the family grew from two to three with the arrival of baby Isla. The kitchen at the rear of the house was less appealing, however, with a relatively narrow galley layout and a space-wasting external passageway running down one side. The original wooden floorboards had been painted dark brown and the pine units were fitted with marble-effect plastic work surfaces. Building into the side return passageway would give Matt and Michelle a wider space and enough additional room for a separate utility room, while extending out into the garden by three metres would create a spacious open-plan kitchen/dining/family room, with folding-sliding glazed doors opening onto the patio. A vaulted ceiling and full-height glazing in a bespoke steel frame would enhance the sense of space in the new extension, with three large skylights maximising the natural light and a feature brick wall and timber flooring introducing warm textures to the contemporary clean lines. Planning approval was needed for the proposed extension, and Martin submitted the application. One potential concern involved the position of a sewer beneath the side return of the house, where the couple wanted to extend. Although this slightly delayed the application, it didn’t prove to be a major problem. The couple had firm ideas for the new space and once again liaised with Martin over the decisions at every stage. Metro tiles have been used in the wet room, which features a large rooflight and a distinctive tiled floor, while the bedroom is dominated by a large brick chimneybreast that has been made into a unique feature. ‘We had some communication problems explaining how we wanted the exposed chimneybreast to look, coming home one day to find it covered in gloss white paint, but it was soon sandblasted back to give it a distressed finish, which created the industrial look we were aiming for,’ says Matt, who was impressed by the quality of the workmanship in both new spaces.